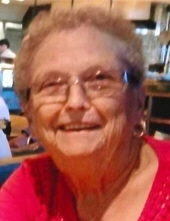 Marlene Ann Johnson, 81 of Altoona, WI passed away Thursday, January 10, 2019 at Sacred Heart Hospital in Eau Claire. She was born in Whitehall, WI on January 26, 1937 the Daughter of the late Norman & Josephine (Hestekin) Garson. Marlene has been a member of St. John’s Lutheran Church in Eau Claire for over 50 years. She enjoyed spending time with her children, grandchildren, and great grandchildren, playing cards with the neighbor ladies, lefse making and baking her famous cookies. Marlene especially enjoyed her children and grandchildren’s sporting events, trips, cruises, trips to Laughlin, family vacations & family get togethers. Marlene is survived by her husband of 62 years Gary; children, Scott (Terri) Johnson, Todd (Becky) Johnson, Cheri (Jeff) Hugdahl, Jerry (Mary) Johnson, David (Christine) Johnson; 16 grandchildren, Sara, Melisa(Joel) Jeremy, Joshua, Heather (Luke), Crystal (Derrick), Jeffrey, Tabitha (Max), Tiffany (Dale), Emily, Benjamin, Abigail (Karl), Madeline, Meredith, Sophia, Gunnar; 13 great grandchildren; A brother, James (Connie) Garson; a sister, Carolyn (Leon) Herried, and many nieces, nephews, other relatives and friends. She is preceded in death by her parents, brother Richard (Darlene) Garson. A funeral service will be held Thursday, January 17, 2019 at 11 a.m. at St. John’s Lutheran Church 1804 Highland Ave. Eau Claire, WI. Friends may visit at Stokes, Prock & Mundt Funeral Chapel 535 Hillcrest Parkway Altoona, WI on Wednesday, January 16, 2019 from 4 p.m. to 7 p.m. and from 10 a.m. until the time of the service at church on the day. "Email Address" would like to share the life celebration of Marlene Ann Johnson. Click on the "link" to go to share a favorite memory or leave a condolence message for the family.